Heat oil in 10-inch non-stick skillet over high heat. Cook mushrooms and onion in oil. Stir in broth, garlic pepper seasoning blend and mustard. Cover and heat to boiling. Stir in remaining ingredients except spinach; reduce heat to low. Cover and simmer 10 minutes, stirring once. 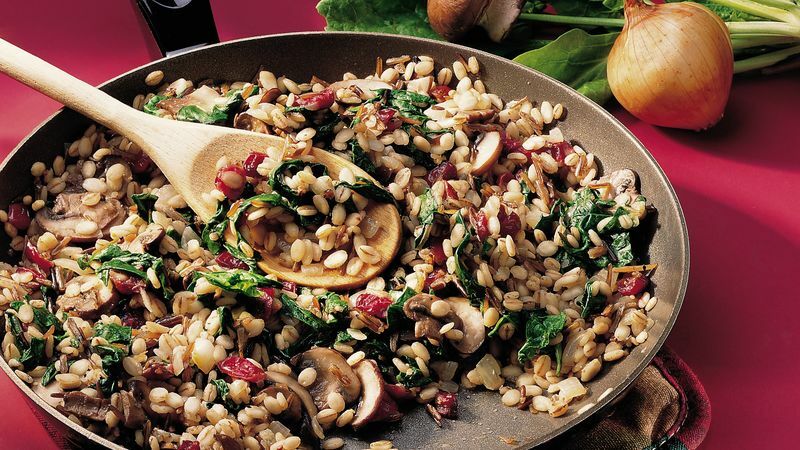 Stir in spinach; cover and simmer about 5 minutes or until water is absorbed and barley and wild rice are tender. Pearl barley gives this dish the creaminess of the traditional long-cooking risotto that uses arborio rice, and it cuts cooking time! You can also use quick-cooking barley -- it reduces cooking time even more as there is no presoaking, but the dish won't be quite as creamy. *Presoak pearl barley in 2 cups of water at least 5 hours or overnight; drain.